The Mercedes-Benz Fashion Week hit our islands with a bang once again – this time, bigger than ever. Valletta and fashion were clearly on everyone’s mind seeing how all Fashion Week events were fully booked two weeks before its launch. Even though the events concerned during this week revolve mainly around the fashion industry, the fact that most events took place in Valletta, gave attendees the opportunity to appreciate classical venues which are not commonly frequented by the public. The Bridal show, together with the New Designers show, was held at the Sacra Infermeria Hall at the Mediterranean Conference Centre, overlooking the Grand Harbour. Once used as a non-discriminatory hospital by the Order of the Knights of St John, this venue’s dim lighting and glorious chandeliers made it the ideal place for wedding gowns and discovering new talent. The breathtaking marital atmosphere invited us to picture our fantasy wedding with the perfect dress. From haute couture to cheeky slogans on t-shirts, the New Designers show had it all. The two excellent brands of Ferragiu and Nilara had their show in Ordnance Street situated between the new parliament and the Royal Theatre. The models walked gracefully down the beautifully-lit flight of steps, transformed by purple lighting. The designs evoked elegance and delicacy while also asserting the idea of the female figure’s power and dominance. Three exceptional designers showcased their work at the Malta Chamber of Commerce in the Lewis Farrugia Courtyard. The space was filled from top to bottom, with people eagerly awaiting the collections from their seating downstairs and from the overlooking balconies. From Sai Suman’s exotic jungle collection to Julia Boikova’s sporty pieces inspired by rope designs, this show was definitely worth attending. Local talent Marco Parascandolo left the crowd awestruck with his ‘In the Sky’ collection featuring the predominant all-white trend among his famous ‘Skandlu’ slogan. The Caroline Hili event was highly anticipated, and with good reason. Being held at the Barrakka Lift, Lascaris Wharf, we were all curious to see how this fashion show was going to be coordinated. The models descended on to the catwalk via the huge lift to showcase Hili’s exquisitely seductive yet feminine designs to the audience. Ritienne Zammit’s fashion show, held at the Grandmaster’s Palace, was illuminated by camera flashes with people snapping pictures of the stunning architecture and the interesting designs. 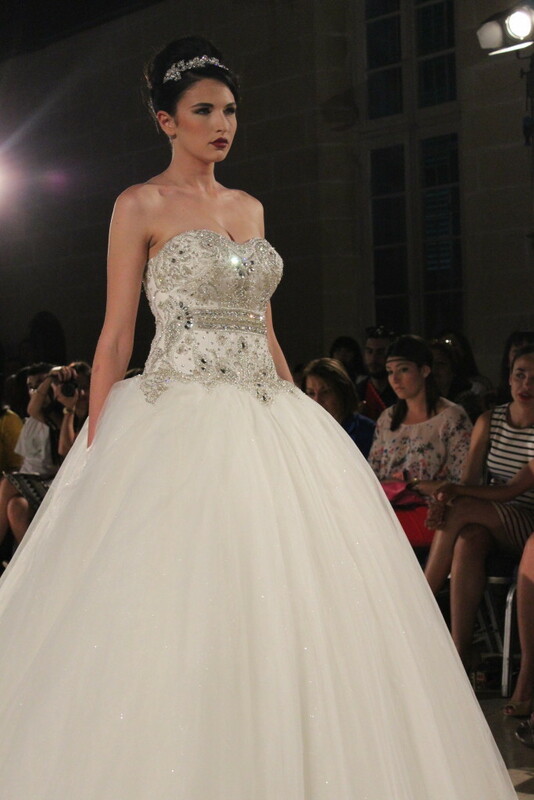 Simply put, Zammit’s collection, ‘L-Omm li Tatna Isimha’ made us feel proud of our Maltese nationality. The artist herself claims that ‘the aim of this collection is meant to arouse the gratitude of our identity, language, and beliefs’. The symbol of a beating heart, symbolising Dun Mikiel Xerri’s attempt to protect Malta’s identity from the French forces, was visible on some of the items presented, while faces of this same patriot and of Manwel Dimech printed on garments also made an appearance. While Fashion Week presents a week of events to discover new talent and designs, it is also an opportunity to explore various historical sites which are generally closed off to the general public, making the discovery two-fold and all the more gratifying.